Coworkers past and present, all seasoned soap scribes, expressed disbelief that “Bold and the Beautiful” (B&B) star Rena Sofer (Quinn Forrester) didn’t make the Daytime Emmy pre-nomination round. The actors who did make it were announced yesterday. Patrick Mulcahey, script writer and story consultant at B&B, celebrated his show’s inclusion in several Emmy pre-noms. “But where’s Rena?” he sked, seemingly bewildered, in a Facebook post. Scroll down to see the post and reaction to it in full. 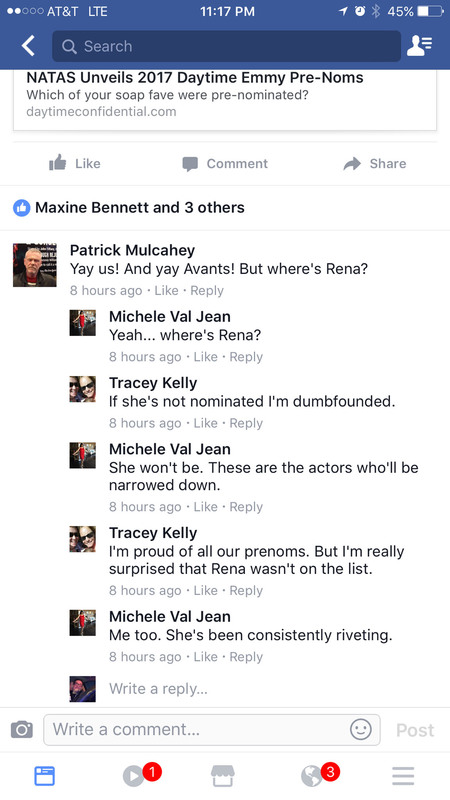 Michele Val Jean, a fellow B&B script writer, agreed. She commended Sofer’s work during Quinn’s many ups and downs this year and astonishment that it didn’t merit an Emmy pre-nomination. Val Jean also worked in several writing positions at “General Hospital” under the head writing team of Claire and Matt Labine. During this time, Sofer originated the one of a kind role of Lois Cerullo. For that work she did win a Daytime Emmy for Outstanding Supporting Actress in a Drama Series. Sofer got yet another compliment in response to Mulcahey’s, this time from B&B script writer Tracey Kelly. Kelly said Sofer has been giving, well, outstanding performances, as the award title goes. She too was surprised Sofer didn’t make the pre-noms. In her soap career, Sofer has played some intense storylines with consummate skill. This past year on B&B, she kidnapped Liam (Scott Clifton), pushed Deacon (Sean Kanan) off a cliff, and married Eric (John McCook). During all of this, she made Quinn’s actions believable and her character sympathetic. Unbelievable! I haven’t really studied any of the pre-NOM lists yet, but I can NOT believe that Rena was left off! I am upset with Steffy’s hair. Cut out the big hair and the blonde. Her hair looks better with depth in color. Smaller hair, shorter also. Her head is too big for her body when teased for fullness on top. Sorry, just my opinion.